Last weekend Pavilion KL celebrated their 8th Anniversary with a feast of experiences including a record-breaking eight feet high Longevity Bun and Malaysia’s Biggest Longevity Bun Replica. The Chinese usually served Longevity Bun during birthday or prosperous or happiness celebration, it’s a type of lotus seed bun. It is white with a red dyed tip with a crease along the side, mimicking the shape of a peach. The longevity bun represents peaches of immortality. According to Chinese folk legends, these peaches ripen every thousands of years and grant immortality to humans when consumed. Not only that, the celebration went off an auspicious note with 8 lions welcoming guests with a choreographed performance of vibrant colours and energetic movements. The whole concourse areawere filled with shoppers and also tourists. Special promotions included the RM8 Feast with special items going for only RM8 and the 8PM deals with 50% discount on selected items after 8pm for the day. Pavilion Junior members which is the mall’s loyalty program for kids also walked away with a special birthday gift for those born in the month of January. The 8 top spenders who shopped on 31st January and 1st February 2016 will be rewarded with fabulous prizes. 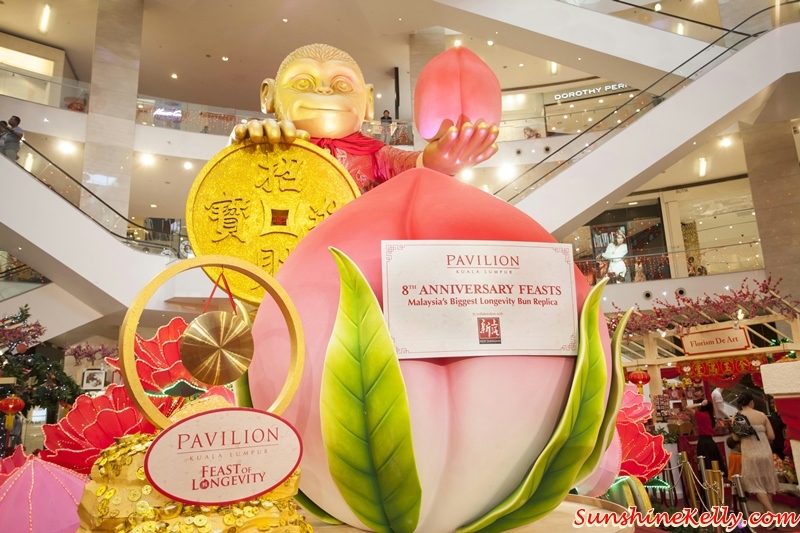 There are total of RM200,000 worth of prizes for shoppers. It might come across as a surprise, but I haven't been invited to any CNY events at all! Sad because yours look really fun and joyous! I want those bun peaches! Must have been very enjoyable! Those buns looks so cute and lovely! I'd feel guilty to eat such a cute well decorated food haha.